Had Gaiman not been the author of this story, would it have been lavished with such illustrations and high production values? Of course not. And what of the young readers who come to the book knowing nothing of Gaiman or how he came to write it? What of the young readers who don’t know that Chris Riddell has drawn Dad to look like a younger Neil himself? For many of these, I suspect, the book won’t fully engage and satisfy as a standalone story in its own right. Although pitched as a children’s book, this latest work doesn’t connect in the way that his previous children’s titles do, and not simply because it’s high comedy. But for dads and older, existing Gaiman fans? Fortunately, The Milk is very likely to be just their cup of tea. via Fortunately, the Milk by Neil Gaiman – review | Books | The Guardian. Neil Gaiman is a man of many faces. Some know him as the author of gloriously mapcap children’s books, others as the writer who got the world to take graphic novels seriously. Still more recognise him as the novelist behind the blockbuster movies Stardust and Coraline. He’s a bestselling author, screenwriter and blogger and he has 1.8 million Twitter followers. And for some people on the Isle of Skye he is that vaguely famous bloke who lives down the road. via Neil Gaiman on why Scotland is his second home – Features – Scotsman.com. Click the link for video of Neil Gaiman’s Newsnight interview with Arts Correspondent Stephen Smith. Gaiman talks about his new book, The Ocean At The End Of The Lane, and his writing of episodes for Doctor Who. 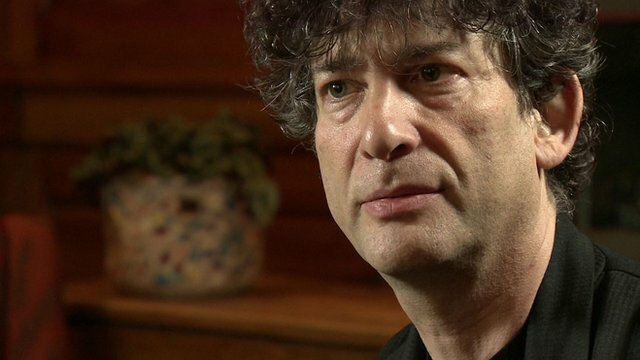 via BBC News – Neil Gaiman on fantasy offering refuge in times of flux. This week’s podcast heads into strange territory, guided by the Books site’s editor-for-a-day, Neil Gaiman. via Neil Gaiman’s Guardian Books podcast: Weird London and the future for writers | Books | guardian.co.uk. via THE SILVER DREAM by Neil Gaiman, Michael Reaves, and Mallory Reaves – YouTube. In his keynote at the fifth Digital Minds Conference, bestselling author and Twitter superstar Neil Gaiman kicked off the London Book Fair by likening the digital transition to being on an unruly, but exciting new frontier. "People ask me what my predictions are for publishing and how digital is changing things and I tell them my only real prediction is that is it’s all changing," Gaiman said. "Amazon, Google and all of those things probably aren’t the enemy. The enemy right now is simply refusing to understand that the world is changing." via London Book Fair 2013: In Keynote, Gaiman Says 'Try Everything'.